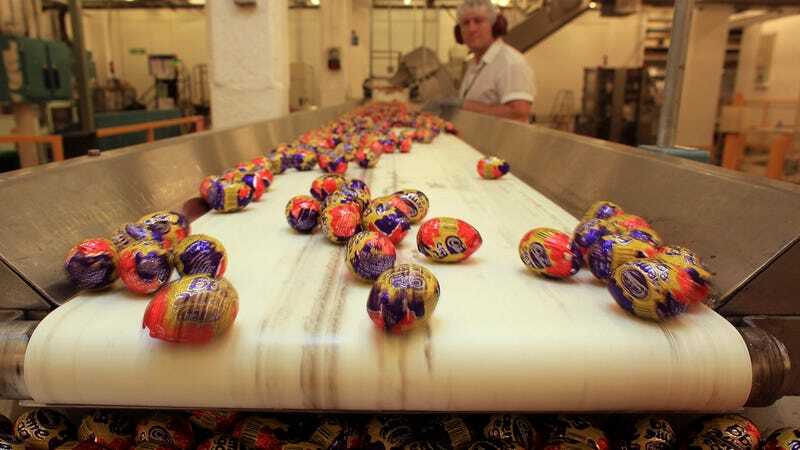 You can now find pounds—in more ways than one—inside Cadbury Creme Eggs. Well, in England at least. Candymaker Cadbury announced a promotion around limited-edition white chocolate eggs that will stash prize vouchers inside select eggs, with amounts ranging from £100 to £2000 ($135 to $2700ish, respectively). The Independent reports that there are rumored to be about 371 of these special white chocolate eggs at English grocery stores including Co-op, Sainsbury’s Local, and Tesco Express. They’ll be packaged just like regular milk chocolate Creme Eggs, though, so there’s no way to tell which are the special white chocolate versions. If a shopper finds one, he or she must save the foil wrapper which contains instructions on redeeming the prize. If we’ve learned anything from Willy Wonka & The Chocolate Factory—and we’ve learned much—it’s that, should you find a prize candy, remember to hug your grandparents, stay away from TV sets, and don’t harass the Oompa Loompas. Just how good is an $8 packet of instant ramen?